Parts or elements of a quadrilateral are discussed here. 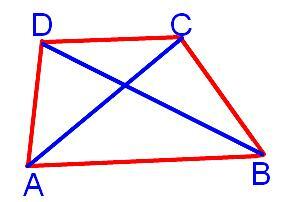 ABCD is a quadrilateral with four sides namely AB, BC, CD and DA. It has four vertices namely A, B, C and D. The angle between two adjacent sides is an angle of the quadrilateral. So, a quadrilateral has four angles that is, ∠DAB, ∠ABC, ∠BCD and ∠CDA. A line segment joining a pair of opposite vertices is called a diagonal. So, there are two diagonals namely AC and BD. A quadrilateral may have some relations between its sides and angles. On the basis of these relations, quadrilaterals are classified and given different names.